Gigantic Thoth Tarot reproduction contending for Guinness World Record – Zero Equals Two! The Grand Midway Hotel in Windber, PA, hopes its gigantic re-painting of The Universe from the Thoth Tarot will land in the Guinness Book of World Records’ newly-created category, “World’s Largest Tarot Card.” If so, it would mark the second world record for the hotel, which previously snagged the honor of “World’s Largest Ouija Board” on its rooftop. If it isn’t obvious, the hotel prides itself on its macabre decor, which appears throughout the hotel and its sleeping rooms. Measuring nearly 24′ x 17′, the Thoth Tarot reproduction was painted in 4 x 8 sections over six weeks by tattoo artist Terence Kauffmann. The 12 panels making up the finished piece hang from the ceiling of the hotel’s former ballroom, now designated the grand dining room. 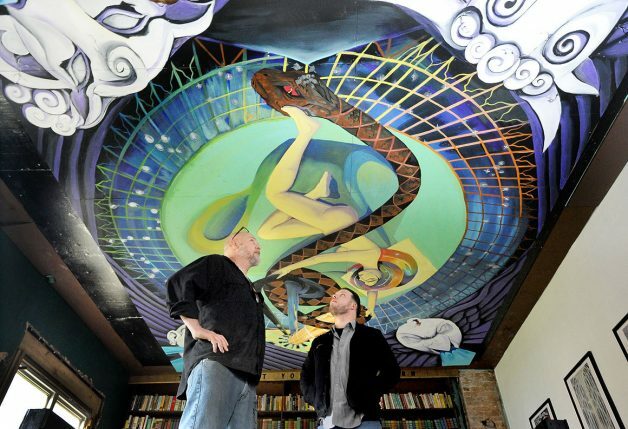 Grand Midway Hotel owner Blair Murphy (left) and artist Terence Kauffmann (right) stand beneath a massive 24′ x 17′ re-painting of The Universe from the Thoth Tarot in the hotel’s dining room. Long ago I chose the Universe Card from Aleister Crowley’s Thoth tarot deck for our subject, magnificently painted by Lady Frieda Harris during their 1938-1943 tarot collaboration. (Crowley was an occultist, poet, painter, novelist, and ceremonial magician who first guided painter Harris over his project to update traditional tarot. But Crowley was soon passionately inspired by Harris’ encouragement and challenge to attempt invoking a far bolder, multi-occult, new tarot symbolism, one of swaggeringly new heights of exploration and testament of magical, scientific, and spiritual aspiration for a new era. Their project of six months grew into a fanatical venture of six years.) The Universe Card and its changing imagery in decks through time, earlier called The World Card, is worthy of delicious exploration and contemplation if one wants to really enjoy a feast in the arts as they are paintings of symbols soaked with spiritual magnitude. 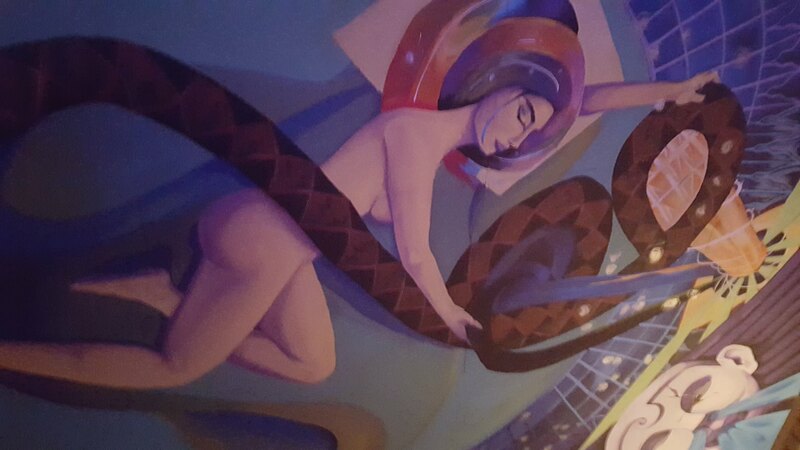 Another shot of the mural, by Sr. Kashmira, offers a clear view of The Universe‘s central figure, whose face in this version was modeled after a friend and supporter of the Grand Midway Hotel. We wish Blair, Terence, and the Grand Midway Hotel the best of luck in their pursuit of this world record. For more information and a brief video, see the story in the Tribune-Democrat. Richard Kaczynski is the author of the biography Perdurabo: The Life of Aleister Crowley (2002; rev exp ed 2010), the history Forgotten Templars: The Untold Origins of Ordo Templi Orientis (2012), and the novel The Billionth Monkey (2015), along with a bunch of other books, articles, and chapters that you can read about at his website, www.richard-kaczynski.com.